Mateo aka MTO is a French artist known for his grey scaled photo-realistic works of art, mostly portraits, which stand out from the masses because of their high quality, that led him to become a respected artist in the Graffiti and Street art scene. He was born in France, and then moved to Berlin in 2006, just to leave if 7 years later. And, that pretty much sums all that he is willing to discover about himself. Visiting Barcelona was the kick-start for MTO’s work on the streets. The vibrancy of the city’s exterior culture inspired him to create. Yet his work, although labeled street art, goes way beyond graffiti. Berlin is the city where he has represented some of his best work throughout his career so far – black and white graffiti with a touch of red and pink of mostly famous pop culture icons, but also some really known movie scenes. 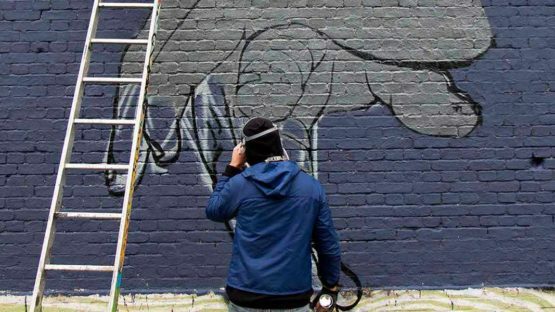 He has left Berlin in style – by painting Ciao, Berlin on its walls. In just 7 Berlin years the French Street Artist MTO, known for his grayscale photorealistic works of art, mostly portraits, which stand out from the masses because of their high quallity, has become a respected artist in the Graffiti and Streetart scene. The last time Berlin “saw” MTO was on the 11.10.2013, when he was painting a new work of art during the “Street Art Meeting” which took place at “Yaam Berlin“. At the time, we, like most other people, had no idea that his decision to leave the city had already been made. MTO sprays his portraits with a typical red outline (that is part of the artwork and his signature at the same time) – usually of people who inspired him. For that reason he started painting musicians like the young Michael Jackson, Ray Charles or Jimmy Hendrix but also movie actors and their most interesting film scenes, like Jack Nicholson from “Shining”, Robert De Niro from “Taxi Driver” or Angelina Jolie from “Tomb Raider”. Some of the most interesting works of MTO for street art lovers are definitely the portraits of Berlin based street artists like Emess, Alias or 4rtists (aka. Mr.6). Of course he proofed his skills also by painting objects like big turntables or showed a lot of humor by painting the German chancellor Angela Merkel as a punk in the old art house Tacheles. The portraits are 8-9 feet high and wide and it takes him about 2-5 hours to finish one piece which sounds amazing when you take the quality of his work in consideration. His art also interacts with the environment around it. The current location of MTO is unknown. Or, as he says: Currently living in “Nowhere”, Planet Earth.